In a claimed world first, Japanese Tier I parts manufacturers are molding water impellers that feature integrated motor rotors in an insert molding process carried out on vertical presses. These electric-powered impellers employed for motor and cabin cooling are used on hybrid vehicles such as the Prius. According to machine supplier Sodick (Yokohama, Japan), the company’s V-Line plunger system is highly suited to this application given that it prevents the formation of gas voids in the final molded parts. “These voids can be a cause of structural failure,” says Koji Maeda, sales director Sodick Korea (Seoul), who was speaking to PlasticsToday at the recent Koplas show in Seoul. Sodick says its V-Line plunger system employing a non-reciprocating screw for plasticization results in the resin being subjected to less shear during metering and injection, and consequently less thermal degradation and offgas generation, which causes voids. 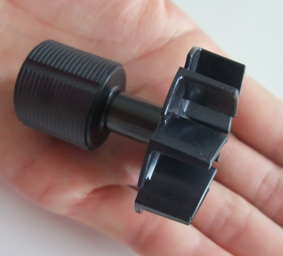 Further, a unique backflow check mechanism positioned at the tip of the screw prevents backflow, which also minimizes thermal degradation. The impeller/rotor parts are molded from glass fiber-reinforced PPS resin, with magnet inserts being placed in the tool. The cycle time is approximately 30-40 seconds. Impellers in conventionally-powered vehicles are powered by the engine and thus do not require an electric motor. The water pump impellers are molded on 75-100-tonne vertical presses in two or four cavities.